Kayla Fioravanti of Ology Essentials and Stacey Haluka have been hard at work on their new book The Unspoken Truth About Essential Oils available in full-color paperback and Kindle. The contributors to the Unspoken Truth About Essential Oils include: the Foreword by Dr. Robert Pappas (also know as Dr. P.) of Essential Oil University, an Adverse Reaction Report from Robert Tisserand of the Tisserand Institute, Conclusions by Martin Watt of Aroma Medicine, and the Epilogue by Sylla Sheppard-Hanger of the Atlantic Institute. A STORY THAT MAY LEAVE YOU QUESTIONING EVERYTHING YOU THOUGHT YOU KNEW ABOUT ESSENTIAL OILS, FOLLOWED BY THE ANSWERS YOU NEED TO CONTINUE USING THEM SAFELY. You are about to embark upon a journey that may shock you and cause disbelief, however the fact remains that this is a true story. It is the truth that some essential oil corporations want to hide from you. In this book Stacey takes you along on her raw and real journey that is eye-opening for for the reader. She will reveal the unspoken truth about essential oils so that you can learn the lessons learned from her experience. Her story is not unique and can happen to anyone, at any time. You will want to read this truth to prevent harming yourself, or anyone you love. Stacey’s true story is followed by an Adverse Reaction Report by Robert Tisserand and Conclusions by Martin Watt, both of which will help you understand what went wrong for Stacey. Certified aromatherapist, Kayla Fioravanti, will help you gain wisdom by guiding you through what the industry experts advise for safe use of essential oils for a lifetime of wellness. This book is such a timely and much needed realistic view of what’s really happening in the growing sect of essential oil. 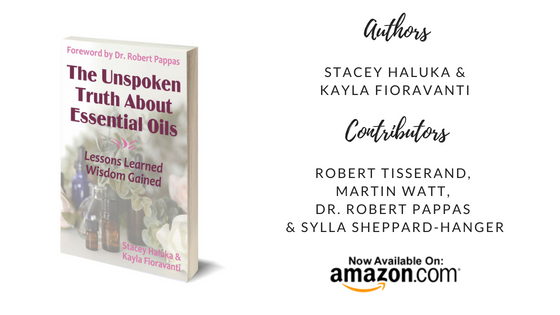 Stacey Haluka and Kayla Fioravanti are a wonderful pairing of two women on different plains with a common goal….to inform the public of the real and present unspoken truth about essential oils and the current misguided trends of use and information being widely perpetuated. And in the process, hopefully prevent more people from experiencing life altering events to their health and personal well-being from the misinformed and ill-advised rhetoric surrounding essential oils and the complementary therapeutic modality of aromatherapy. Sadly, Stacey’s experience is not isolated or exaggerated. We in the field of aromatherapy are, unfortunately, seeing and hearing personal accounts of minor to severe injuries and adverse reactions—from misuse and over-use of essential oils, stemming from uneducated guidance—happening far more frequently. Medical advice and usage protocols are being given by masses of people solely trained in sales and “business building” often representing themselves as professionals with extensive education and expertise in health and wellness modalities. But nothing could be farther from the truth. It’s now reached a critical point that can no longer be shoved under the rug or denied, though many may try. Kayla steps up to the plate with her no-nonsense approach, skilled writing and expertise as a long-time qualified aromatherapist to address the many myths, lies, and dangerous practices that have become epidemic in nature. She takes her many years of education, research and experience—pulls on the reserves of the science and art that makes aromatherapy what it really is—and delivers a serious reality check we all can learn from and should heed with respect. Kayla introduces a balance and accountability in regards to these potent chemicals that’s both refreshing and eye-opening. Starkly contrasting to what is predominantly seen and referenced in the digital and hard copy world today, her wise words combine research-based evidence with anecdotal experience to bring us front and center without rose-colored glasses, grandiose promises, or claims that blind and redirect the reader from reality. The Unspoken Truth About Essential Oils is available in full-color paperback and on Kindle. Please help spread the word about the SAFE use of essential oils. You can join the Unspoken Truth About Essential Oils Facebook Group to get up to date information on safety.